For now, it’s the RLD that’s leading the Opposition charge. The party’s president Ajit Singh, who is contesting from communally sensitive Muzaffarnagar, is addressing about public meetings every day, and has held joint meetings with local leaders of SP and BSP. With eight days left for campaigning to end in the first phase of the Lok Sabha elections, the report card of the Opposition “gathbandhan” in UP presents an interesting picture: Ajit Singh’s RLD is first off the blocks, holding at least 4-5 public meetings and about 20 “nukkad” sabhas daily in the eight constituencies in western UP that vote on April 11. But its major partners, SP and BSP, are yet to step up the pace. 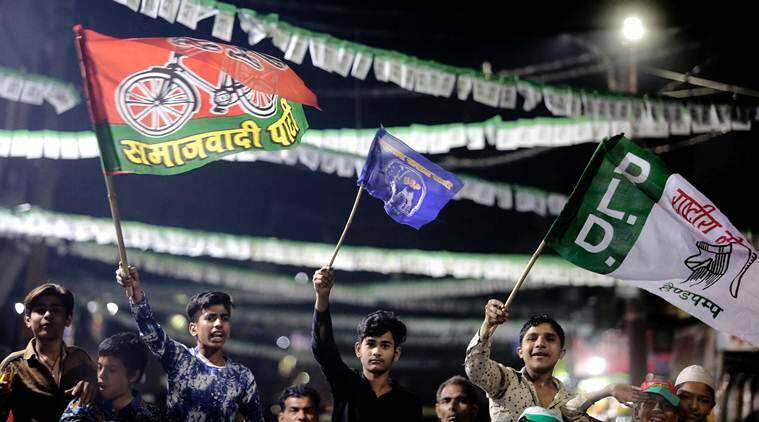 An SP leader said that strategies are still being worked out and that their “regular campaign” will take off only after a joint rally by Akhilesh Yadav, Mayawati and Ajit Singh on April 7 in the Deoband area of Saharanpur. Out of these eights seats, BSP is contesting from Saharanpur, Bijnor, Meerut and Gautam Buddh Nagar; SP from Kairana and Ghaziabad; and, RLD from Muzaffarnagar and Baghpat. This stretch has a decisive number of Muslim and Dalit voters. The campaign concludes on April 9, just two days after the SP-BSP-RLD’s first joint rally. As for the BJP, Prime Minister Narendra Modi addressed a public meeting in Meerut on March 28, and will speak again in this belt on April 5 in Saharanpur. Party chief Amit Shah and UP Chief Minister Yogi Adityanath have addressed three rallies each in the region. Singh’s son and RLD vice-president Jayant Chaudhary, who is contesting from Baghpat, has addressed more than 70 “nukkad” meetings in the last 20 days. Besides, he has already participated in a roadshow, held over half-a-dozen meetings with local leaders of SP and BSP, addressed a public meeting for BSP’s Meerut candidate Haji Mohammad Yaqub, and canvassed for SP’s Kairana candidate Tabassum Begum. On Tuesday, Chaudhary will address two “nukkad” sabhas for SP’s Ghaziabad candidate Suresh Bansal. “The local leaders of SP and BSP are joining the campaign. Akhileshji and Mayawatiji will be joining on April 7,” RLD spokesperson Anil Dubey said. Another RLD leader said Akhilesh will campaign on April 8 for Chaudhary in the Baleni area of the Baghpat constituency because “it has the presence of Yadav voters”. The leader said that “either Jayant or Ajit Singh” will join Mayawati’s public meeting in Meerut the same day. Following their poll tie-up in UP, the BSP is contesting from 38 seats, SP from 37 and RLD from three.